Malaga and the Costa del Sol make it easy for those who seek adventure and want to discover new places to stay in and enjoy a more unusual and different trip, without compromising on comfort. If you consider yourself an adventurous and curious person who loves to explore, with an authentic wanderlust, you cannot miss the selection of original accommodation which we have prepared for you. Have you ever thought of camping in open air without sacrificing the comfort of the best hotels? If you already have this idea in mind, you must know that this phenomenon has a specific name: glamping, or glamorous camping, and it is fast becoming a global trend. If you are a nature and comfort lover (we know that both things can be combined) we highly recommend the Glamping Airstream in Alozaina, where you will be able to sleep in a vintage style van whilst you gaze at the stars. Furthermore, you will be able to enjoy your stay in the most relaxing way you could have possibly imagined as there is only one van available! Tranquility and disconnecting yourself from reality are guaranteed, with the van boasting services as excellent as those of a 5-star hotel. Located in the heart of the Sierra de la Nieves National Park, one of the most beautiful parks in Spain, you will not want to miss out on this stunning accommodation. For the wine enthusiasts, the old winery ‘Antigua Casa de Guardia’ known as ‘the temple of wine’ of Malaga, offers you the option of sleeping in one of their wine barrels. Aimed at promoting rural tourism, which is so much in vogue nowadays, each of the wooden huts, shaped as wine barrels, can host up to 4 people. The winery, located in ‘Finca El Romerillo’, on the road from Olías to Comares, has taken another step forward in wine tourism becoming the first one in Spain to offer these kind of services. During their stay, guests will also be able to learn more about the history of Malaga’s wines, from the cultivation of the vineyards, different types of grapes to the production, taking them through the lifestyle of the winery itself. Of course, the most intrepid of travellers wouldn’t want to miss out on the opportunity to stay in a snail shell - only if it was possible of course. However, in Torrox, Málaga, you can find one of the most picturesque hotels in Andalucía, ‘Los Caracoles’ (Snail Shells). 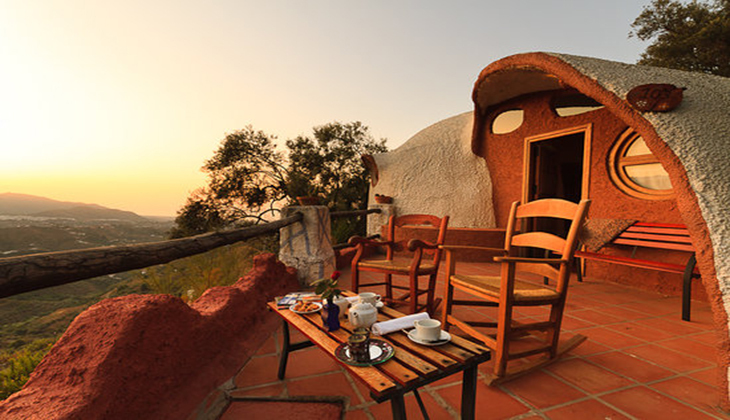 Their bungalows, whose shapes are inspired by snail shells, hence the name, feature a main bedroom with a living room, bathroom and front porch where you will enjoy the most stunning views of the surrounding nature. On top of that, all the facilities have been recently renewed, making it the perfect place to have a unique experience; surrounded by mountains and enjoying the spectacular views of the Sierras Tejeda, Almijara and Alhama Natural Parks as well as the Nerja coastline. Don’t worry if one of you prefers sea views to mountain ones, as both landscapes can be admired from the window of these wonderful snail-shell shaped cottages.